If you take the ferry over to Ward’s island and follow the path along the south side of the quaint island community, you’ll soon come through some thick trees and come up against the east side of Ward’s itself. There’s not much there; a thin, crumbling concrete strip jutting out from the shore, and the usually vacant-looking Toronto port, 600-odd feet on the other side of the channel. It does offer a pretty fantastic view of downtown, and in the summer you’ll see sailboats and kayaks going through the canal, taking scenic routes around the big park. But it wasn’t always that way. It never is. Dun dun dun. If you’ve read this post you’ll know the island had its first building, the Gibraltar Point Lighthouse, built in 1808. There weren’t many permanent residents for a few decades, but by the mid 1800s it was a pretty happening place. Part of the reason for that was that at this point, it wasn’t the Toronto islands at all. It was a peninsula, connected on the East side by a strip of land that splayed out Westward into a marshy bay. One of the first British plans for the town of York in 1792 – look at how connected that land is! 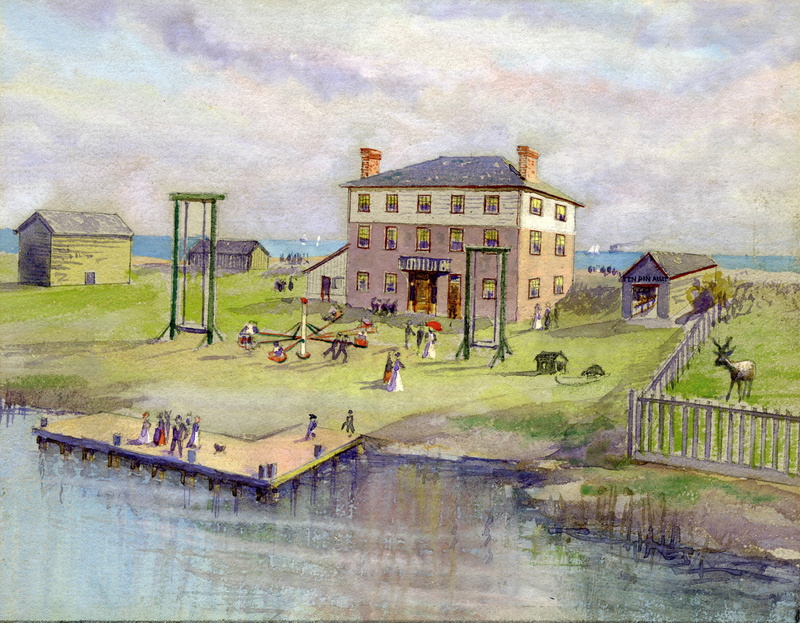 In 1833 the first hotel, called the Retreat on the Peninsula, was built on the island – even then people wanted a peaceful getaway from the urban sprawl. The hotel changed hands a number of times between 1833 and 1858. Over that period of time, that thin slice of connecting land got thinner and thinner as amusements and some houses were built. There were ferries that shipped people and stuffs over from the mainland, but there was still foot traffic that came across the East side. August 1857 marked the beginning of the end for our dear peninsula. There were a couple of particularly nasty storms, one of which caused the hotel proprietor to evacuate (himself, his family, his guests, and his furniture. Must’ve been really nice beaver pelt couches or something). The seaward wall caved in and the roof almost got torn off before the storm eventually subsided. It was basically just a large sandbar though. I’m pretty sure it went down a little something like this. Needless to say, I don’t think the hotel did much business after that. The hotel in 1850. Also…is that a beaver tied to a doghouse? And a deer fenced in?! And TWO GIANT GUILLOTINES?!?!? What IS this place?! And here’s the map today. The full report of the Harbour Commisioner’s is actually really interesting – he talks about how the change will be good for the sanitation of the city, and reminisces about the good old days of grazing cattle and plenty of trees on the peninsula. “In reporting upon the state of the Harbour, I cannot avoid mentioning, as connected with it, the great change that has taken place in the aspect of the late Peninsula, now a confirmed Island. … the late gales in December last, as reported to me by the Island watchmen, have opened … further west, sweeping away fifty trees, nearly the last of the last remaining clump. … The sea now ranges freely over most of the remaining beach in all easterly and southerly gales, and the marsh is detaching in large masses and floating about the bay. In a sanitary point of view along, this may be of great advantage; for agitation being inimical to marsh growth, the action of the wave will destroy all within its range. Already a very large space within the bay is open water. Those who remember the Peninsula thirty years ago, with its broad neck, its groves of trees, its cattle feed, and lake road under a high bank, will now on visiting it, find all replaced by a permanent and wide opening to the lake, and a low, narrow strip of beach extending west, almost without a tree, over nearly the whole of which the sea ranges during north-east gales. 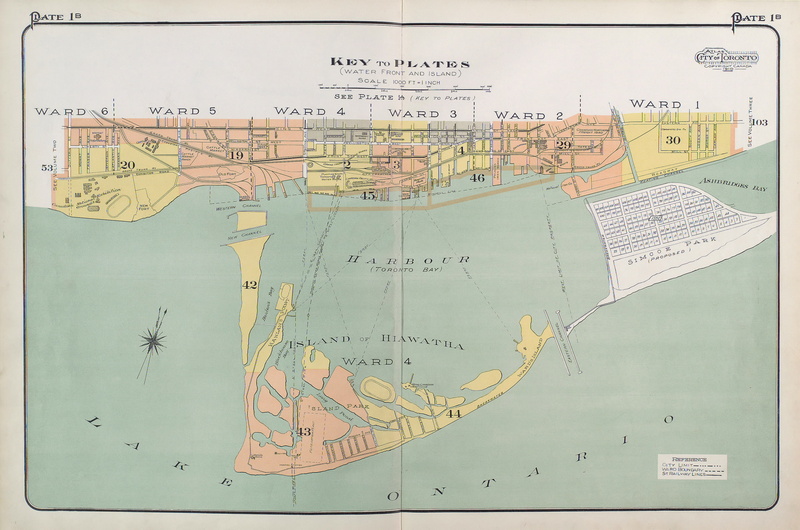 The Peninsula destroyed, marks the first great phase of change in the barrier that forms the southern boundary of the port of Toronto. Its connexion [sic] with the mainland cut off, bereft of all material supply, the future results of nature’s operations on the island must be destructive. The people on the Island report the whole line of beach West as wearing away, and the light-keeper at Gibraltar point, announces that point as greatly reduced. At the same time a resident at Blockhouse Bay reports the great increase of the tongue of the Island that forms the Bay, tawards [sic] the interior of the Harbour; indicating by that sign, a draught[sic] of current from West to East; the water in strong S.W. 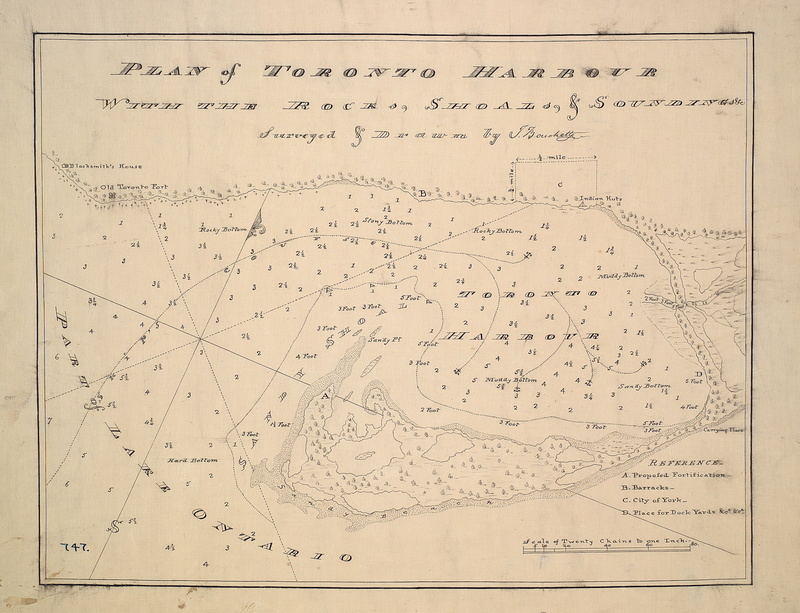 gales finding egress by the mouths of the Don through the marsh and out at the opening in Ashbridge’s Bay; instead of being forced to return by under current to the mouth of the Bay of Toronto and by the navigable channel. Who says history is boring?!?!? !